"Don't knock the weather; nine-tenths of the people couldn't start a conversation if it didn't change once in a while" said Kin Hubbard. You've come to the right place for changing weather. Blink. Sneeze. Hiccup. The pattern changes. You think this is cold? Ha! Wait until next week, which looks like the coldest week of 2019. Just a hunch, but if a friend in Ft. Myers, Florida invites you down for a visit next week, use up some of those frequent-flyer miles. Arctic air spills south in waves. Temperatures fall through single digits Thursday. I expect a dry sky and fairly good travel conditions into Saturday morning, but the approach of the coldest air (possibly of winter) spins up a more impressive Alberta Clipper Sunday PM into Monday morning. It's way too early to delve into amounts, but models are consistently printing out a plowable accumulation early next week. Daytime highs may not climb much above zero from Tuesday into Thursday of next week. A milder Pacific breeze kicks in by February, but next week should be (very) character-building. Threading the Needle. Ground blizzards with white-out conditions are possible over far western Minnesota and the Dakotas later today into Thursday as arctic air pushes south. Not so much from falling snow but rather high winds lofting snow already on the ground into the air. Map: Praedictix. Oh Canada. Really? Thursday wind chill values will dip to -20F in the Twin Cities; by Friday morning we wake up to air temperatures ranging from -10F in the MSP metro to -23F at Brainerd. Cold enough. Maps above: Praedictix and AerisWeather. Subzero Stretch. Friday and Saturday are the appetizer - the main event may arrive next week with 2 or 3 days below 0F in the Twin Cities, if you believe ECMWF. Temperatures moderate as we push into February - you'll be amazed (and saddened) by how good 20s can feel after a numbing spell. Graphic: WeatherBell. Regaining Some Feeling in Our Extremities. By the evening of February 5 GFS guidance shows a prevailing wind from British Columbia, not Hudson Bay, so that should translate into a return to more typical temperatures with highs mostly in the 20s; maybe a few 30s by the second week of February. Brace for the Polar Vortex; It May Be Visiting More Often. Here's an excerpt of a good explainer from The New York Times: "...The melting sea ice, particularly in an area near the Barents and Kara Seas off Siberia, may be linked to the changes in the polar vortex. “When we lose a lot of ice in that particular area in the summer, it absorbs a lot of extra heat from the sun,” Dr. Francis said. This is because the darker open ocean absorbs more heat than reflective ice. “And so we see a very persistent, hot spot there in terms of temperature differences from what they should be.” Research suggests that the hot spot, along with changes in the jet stream driven by climate change, cause the polar vortex to break down in mid- to late winter. “As the Arctic gets warmer and warmer, the severe weather picks up,” Dr. Cohen said..."
Blizzard to near-blizzard conditions are possible this morning with falling snow and strong winds south and east of Denver into parts of southwestern Nebraska and northwestern Kansas. As the same system responsible for those blizzard conditions moves into the central United States, heavy snow and some ice is possible through Wednesday across the upper Midwest and Great Lakes. The heaviest snow is expected to fall from central Iowa into northern Michigan, where a band of at least 6” of snow is possible. Ice of up to two-tenths of an inch will be possible from Iowa into southern Michigan. A second system pushing into the upper Midwest Wednesday and Thursday will cause the potential of a ground blizzard across parts of the Dakotas and western Minnesota with blowing snow reducing visibilities due to strong winds. Tuesday Morning Radar. Two areas of heavier snow are falling across parts of the central United States this morning. The first is across parts of the Front Range, with strong winds creating at least near-blizzard conditions. The second is across parts of the upper Midwest, with 8” of snow reported around Grand Rapids, MN. Meanwhile, some freezing drizzle is being reported across south-central and southeastern Minnesota, with freezing rain and sleet across parts of Iowa. Strong Morning Wind Gusts East And South Of Denver. Winds have been gusting over 40 mph this morning across parts of Colorado. This is causing blowing snow, reducing visibility across the region. Kansas City, MO: Winter Weather Advisory from 5 PM today to 3 AM Wednesday for a light glaze of ice and minor snow accumulations. Rain that falls today will flash freeze as temperature fall below freezing tonight. Omaha, NE: Winter Weather Advisory through Midnight tonight for an additional 2-4” of snow and one to two-tenths of an inch of ice. Des Moines, IA: Winter Storm Warning through 6 AM Wednesday for 4-6” of snow and one to two-tenths of an inch of ice. Minneapolis, MN: Winter Weather Advisory through Noon today for 1-3” of snow. Duluth, MN: Winter Weather Advisory through Noon today for 1-3” of snow. Milwaukee, WI: Winter Storm Warning from 9 AM today to Noon Wednesday for 5-8” of snow and up to a tenth of an inch of ice. Chicago, IL: Winter Weather Advisory from Noon to Midnight today for one to two-tenths of an inch of ice this afternoon and up to an inch of snow this evening. Detroit, MI: Winter Weather Advisory from 7 PM tonight to 2 AM Wednesday for less than an inch of snow and up to a tenth of an inch of ice before precipitation changes to plain rain overnight. Snow And Ice In The Upper Midwest And Great Lakes. Snow and ice will fall across parts of the upper Midwest into the Great Lakes over the next 24-36 hours, pushing out of the Great Lakes as we go through the day Wednesday. This snow and ice will have the potential of impacting both the Tuesday evening and Wednesday morning commutes. Expected Snow. The potential of 6” or more of snow (indicated by purple on the above map) exists from areas of central Iowa into southwestern Minnesota eastward across southern Wisconsin, including Milwaukee, and up into northern Michigan. This snow will have the potential to impact travel across the region. Expected Ice. An icing potential also exists with this storm, with the potential of up to about two-tenths of an inch of ice from central Iowa across the Chicago metro into southern Michigan. This ice could cause hazardous travel conditions with slippery road conditions. Winter Storm Watches For Blizzard Conditions. Meanwhile, as another system dives south through the upper Midwest Wednesday into Thursday, winds will increase, potentially causing a ground blizzard situation. This is where there is no snow falling from the sky, but the snow already on the ground is enough with strong winds to create blizzard conditions. Winter Storm Watches are in place across parts of the Dakotas and western Minnesota for Wednesday afternoon into Thursday morning due to this potential. Some of the cities under this Winter Storm Watch for blizzard conditions include: Minot, Bismarck, Devils Lake, Fargo, and Grand Forks (ND), Aberdeen and Pierre (SD), and Moorhead and Fergus Falls (MN). Potential Wind Gusts. Strong wind gusts helping to cause those blizzard conditions are expected across the Winter Storm Watch area from the second half of the day Wednesday into Thursday. Blowing snow will also be possible into southern Minnesota and Iowa Thursday as well due to gusty winds. January Temperature Records. Some perspective on record warmth earlier this month from Mark Seeley at Minnesota WeatherTalk: "...Indeed it was not especially unusual to see a new maximum temperature record set on January 4th last week in the Twin Cities with a reading of 47 degrees F, but breaking the old record by 6 degrees F (max temp of 41 degrees F in 2007) was relatively rare. In the Twin Cities climate record which dates back to 1873, about 53 percent of all daily maximum temperature records on the calendar broke the previous record by just 1 or 2 degrees F. So this margin for record breaking values of maximum daily temperature is pretty common throughout history. Only about 14 percent of the time is the old maximum temperature record broken by 6 degrees F or more, as it was on January 4th this year..."
Everything You Need to Know About the Fourth Industrial Revolution. A story at CNBC.com caught my eye: "...Schwab argued a technological revolution is underway “that is blurring the lines between the physical, digital and biological spheres.” Simply put, the Fourth Industrial Revolution refers to how technologies like artificial intelligence, autonomous vehicles and the internet of things are merging with humans’ physical lives. Think of voice-activated assistants, facial ID recognition or digital health-care sensors. Schwab argued these technological changes are drastically altering how individuals, companies and governments operate, ultimately leading to a societal transformation similar to previous industrial revolutions..."
The New Surveillance Capitalism. Prospect Magazine in the UK has more perspective: "...Whereas Apple, Amazon and Microsoft are extraordinarily disruptive in all sorts of ways (for just one example, see Houman Barekat on publishing) they are also recognisably conventional businesses which provide goods and services to paying customers. The other two, by contrast, are masters of a new surveillance capitalism. The billions of people who use Google and Facebook are not their customers. Instead, advertisers are—which has given rise to the mantra “if the service is free, then you are the product.” Many of the grumbles about Apple, Amazon and Microsoft are much the same as those that were heard about monopolists of the past..."
Dog Accidently Runs Half-Marathon After Being Let Out for Pee, Finishes 7th. Possibly my favorite headline and story of the year, to date. SPORTbible.com has details: "Imagine training for months and months for a grueling, 13.5 mile marathon to be beaten by Ludivine, the two-and-a-half year old Bloodhound. Well that's what happened in the Elkmont Trackless Train Half Marathon in Canada, when a hound decided to join in the fun after being let out for a wee-wee. He crawled under the garden fence, ran towards the start-line and well, the rest is history. Ludivine, who eventually finished seventh in the race, even stopped at the two-mile point to sniff a dead rabbit..."
Jon Bon Jovi Pays it Forward During Federal Shutdown. CNN.com reports: "Jon Bon Jovi is the latest celebrity to help out government workers who are not being paid during the government shutdown. The rocker's New Jersey restaurant announced in a Facebook post over the weekend that federal workers are welcome to a free meal. JBJ Soul Kitchen, which is operated by the Jon Bon Jovi Soul Foundation, is a non-profit restaurant where customers can dine regardless of whether they are able to pay a suggested donation. They can also volunteer in lieu of paying. "In line with our mission, Federal workers are encouraged to join us for a delicious meal and to learn about additional support and resources available in our community," post read in part..."
20 F. high in the Twin Cities on Tuesday. 24 F. average high on January 22. 35 F. high on January 22, 2018. January 23, 1963: A record low of -31 is set at the Minneapolis-St. Paul International Airport. Greenland Ice Melt Reaching a Tipping Point, Study Says. Here's an excerpt of a story at CNN.com: "Climate change is causing Greenland's massive ice sheets to melt much faster than previously thought, a new study has found, and it may be "too late" to do anything about it. The findings could have dire implications for the planet's low lying islands and coastal cities. Eight of Earth's 10 largest cities in the world are near coasts, and 40% to 50% of the planet's population live in areas vulnerable to rising seas. Michael Bevis, a professor of geodynamics at The Ohio State University and the lead author of the study, says the research found that humanity may have passed the point of no return when it comes to combating climate change. "The only thing we can do is adapt and mitigate further global warming -- it's too late for there to be no effect," said Bevis..."
File photo: John Sonntag, NASA. Greenland Ice Sheet at 'Tipping Point': Links and headlines via Climate Nexus: "Greenland is now losing ice at four times the rate it did 16 years ago, according to new research. A study released in the Proceedings of the Natural Academy of Sciences this week finds that melt from Greenland's southwest ice sheet could become a "major contributor" to sea level rise as the world continues to warm. "The only thing we can do is adapt and mitigate further global warming--it's too late for there to be no effect," lead author Michael Bevis said in a statement. "This is going to cause additional sea level rise. We are watching the ice sheet hit a tipping point." (CNN, New York Times $, USA Today, National Geographic). All life is interrelated. We are all caught in an inescapable network of mutuality, tied into a single garment of destiny.” We must protect the one Earth God gave us. Now is the time for Washington to do what is right for all people; we will be driving home that message this week and in all the weeks to come..."
Image credit: "Aftermath of Hurricane Katrina in New Orleans." FEMA. A Mountaineer Writes a First-Hand Report From the World's Melting Glaciers. NPR has the interview with the author; here's a clip: "...I made it a point to go there in the book as well as a couple of the other places because I wanted to find places that I had been to before and had an intimacy with because it's in that way we can really, really understand the gravity of the changes and really see them and know them personally. And so my first time on Denali, for example, was back in 1997. And to go back and be on that mountain 19 years later in 2016, I saw really dramatic evidence of what was happening - things like mosquitoes in base camp and Denali at 7,200 feet on a glacier, which seems preposterous, but that was happening - rockfall high up on the mountain in an area where the temperature in the summer at night still gets down to regularly -15, -20 degrees Fahrenheit. But now it's melting out at times on some of the days that you have to wear a helmet because of rockfall. Even in these wildest places, that's, actually, where we're seeing some of the most dramatic changes..."
U Scientists: Minnesota Is One of the Nation's Fastest-Warming States. Star Tribune has the story: "Minnesota is one of the fastest-warming states in the country and, measured by rising winter temperatures, Minneapolis and Mankato are among the three fastest-warming cities, a team of scientists told state lawmakers Tuesday. Climate change means the state will be buffeted by more supercharged weather — heat waves, droughts, deluges, wind storms, flooding and even wildfires. But for Minnesota, it’s primarily a winter phenomenon. The state’s famous winters are warming 13 times faster than its summers, said Tracy Twine, an associate professor in the University of Minnesota’s Department of Soil, Water and Climate..."
Image credit: Citizens Climate Lobby. Photo credit: "A PG&E truck makes its way past a hot spot during the Camp Fire in Paradise, Calif., in November." Photo: Hector Amezcua/Sacramento Bee/Zuma Press. Economists' Statement on Carbon Dividends. It's a fee and dividend approach, a revenue-neutral approach - one that doesn't necessarily enlarge government, but refunds carbon fees back to consumers to help pay for energy costs during the transition to clean, renewable fuels. Quite a list of economists; here's an excerpt from The Wall Street Journal: "Global climate change is a serious problem calling for immediate national action. Guided by sound economic principles, we are united in the following policy recommendations. II. A carbon tax should increase every year until emissions reductions goals are met and be revenue neutral to avoid debates over the size of government. A consistently rising carbon price will encourage technological innovation and large-scale infrastructure development. It will also accelerate the diffusion of carbon-efficient goods and services..."
Photo credit: "Steam billows from a coal-fired plant in Bow, N.H., Jan. 20, 2015." Photo: Jim Cole/Associated Press. Climate and Cyber Risks Top Concerns Facing the World in 2019. Bloomberg reports: "The failure to tackle climate change and extreme weather events are the most threatening global risks this year, according to the World Economic Forum. Inability to mitigate or adapt to climate change leapfrogged several places on the list as the second-most likely risk facing the world in 2019 after extreme weather events, the WEF said in a report published Wednesday. What’s more, worsening international relations mean the capacity to deal with those major problems has plummeted..."
Image credit: Bloomberg, World Economic Forum Global Risks Report. Glaciers are Retreating. Millions Rely On Their Water. 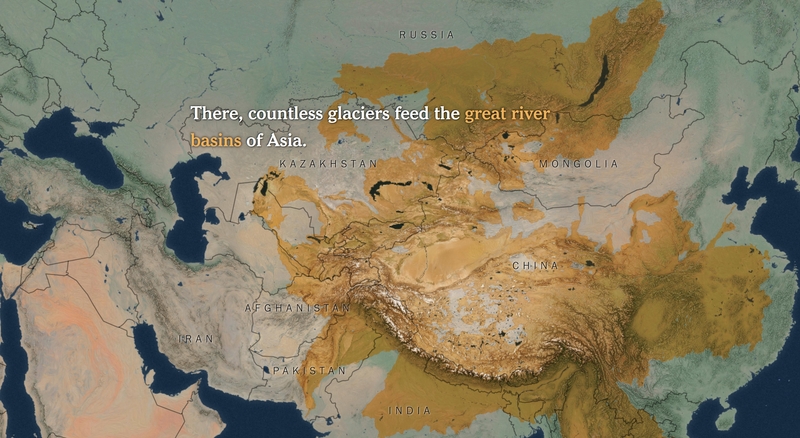 Here's an excerpt of an interactive multi-media approach to story-telling at The New York Times: "...What’s happening in the mountains of southeastern Kazakhstan is occurring all over the globe. The world’s roughly 150,000 glaciers, not including the large ice sheets of Greenland and Antarctica, cover about 200,000 square miles of the earth’s surface. Over the last four decades they’ve lost the equivalent of a layer of ice 70 feet thick. Most of them are getting shorter, too. Some have shrunk to nothing: Smaller glaciers in places like the Rockies and the Andes have disappeared. Even if greenhouse gas emissions were sharply curtailed immediately, there has already been enough warming to continue shrinking glaciers around the world..."
Graphic credit: New York Times. A Few Snowy Shots - Coldest Air of Winter Early Next Week?